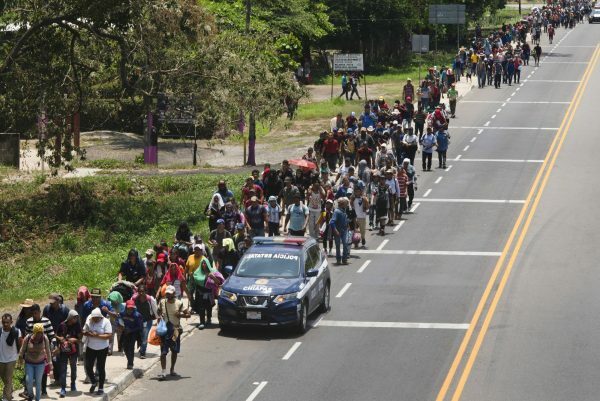 MEXICO CITY—Mexican authorities said a group of about 350 illegal immigrants broke the locks on a gate at the Guatemalan border Friday, April 12, and forced their way into southern Mexico to join a larger group of migrants trying to make their way toward the United States. 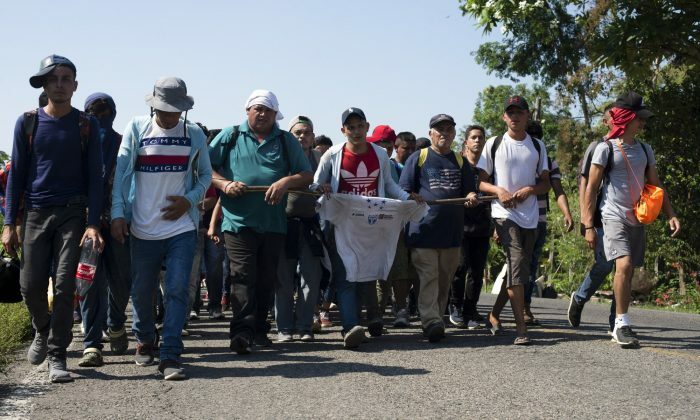 The institute said the illegal immigrants were acting in a “hostile” and “aggressive” way, and accused them of also attacking local police in Metapa, a Mexican village that lies between the border and the nearby city of Tapachula. Claudia Jaqueline Sandoval, 43, from El Progreso, Honduras, was walking toward Tapachula with her 6-year-old daughter. Another son and daughter are already in the United States. A group of several hundred Cuban, African, and Central American migrants have been waiting at the immigration offices in Tapachula for documents that would allow them to travel to the United States border, where most plan to request asylum. The United States has returned the first group of asylum seekers to Mexico, where they will wait out their cases, after the start of a new Trump administration immigration policy. A man named Carlos from Honduras arrived in Tijuana on Jan. 29 under the new policy, called the Migrant Protection Protocol (MPP). He is the first of many asylum seekers from the Northern Triangle who will be sent back to Mexico until their immigration court date in the United States—at which point, they will be allowed to enter the country to attend their hearings. As of Jan. 30, at least a dozen people have been returned to Tijuana through the San Ysidro Port of Entry, including one woman. Honduran migrant Marlon Ariel Mendez was part of a group of asylum-seekers who were returned to Tijuana on Jan. 30. Mendez, 19, told reporters he was glad to be back in Mexico, after being detained in an immigration detention facility. “Thanks to God, I didn’t want to be there [in detention], above all else because of the food,” he said. Mendez said he was not worried about being returned to Mexico. Then-Secretary of Homeland Security Kirstjen Nielsen’s visit to San Diego’s San Ysidro Port of Entry kicked off the start of the policy on Jan. 29. That day only one asylum seeker walked back through the port gates, although the United States has said it will send 20 per day. “The MPP will enable DHS to take a huge step forward in bringing order to chaotic migration flows, restoring the rule of law and the integrity of the United States immigration system, and allowing DHS to focus resources on providing relief to individuals fleeing persecution while at the same time holding those accountable who make false asylum claims,” said Nielsen. Nielsen announced the new MPP in December. The policy is an attempt by the Trump administration to curb the large number family units—mostly from Central America—from traveling north to seek asylum in the United States and subsequently disappearing into the country under the “catch-and-release” loophole. In fiscal year 2017, border patrol apprehended 94,285 family units from Honduras, Guatemala, and El Salvador at the Southern border. Of those, 99 percent remain in the country today, according to the Department of Homeland Security. So far, the policy is implemented in San Diego’s San Ysidro Port of Entry, the busiest border crossing in the country, and has expanded to other ports of entry at the border. Thousands of migrants from the Northern Triangle countries arrived in nearby Tijuana last year. 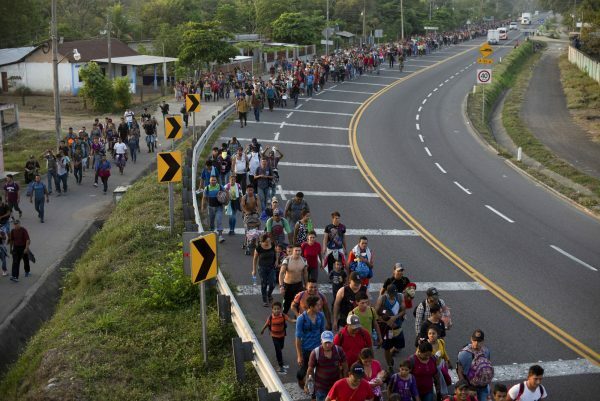 It’s also believed to be the destination of the latest Honduran caravan headed north. Honduran reporter Josue Cover told The Epoch Times on Jan. 17 that coyotes encourage migrants in the caravan to bring young children along the journey north. “The coyotes tell them that ‘please, if you are going to come, then come with a minor, with a baby, because that way you are given more support,’ that is, they are given the opportunity to cross to the United States,” said Cover. Cover said local coyotes also tell minors they have a better chance of entering the United States if they go alone.